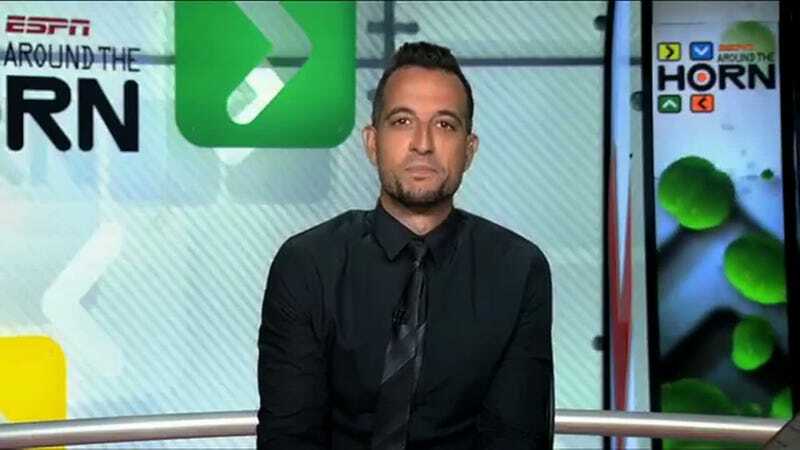 Tony Reali returned to Around the Horn on Monday for the first time since his wife, Sam, gave birth to a son, Enzo, while the other twin, Amadeo, died shortly before being born. Reali spoke about loss and grief and about how it’s OK not to be OK. Anyone within a galaxy of me knows we were expecting twins. We lost Amadeo in the moments leading up to childbirth. We delivered Enzo weeks early in an emergency. Last week was our memorial mass for Amadeo. This week Enzo came home happy, healthy and strong. The duality of all this – the anguish and the joy – is impossible to grasp. But it’s one we know we must navigate. For me that means two things: giving voice to our feelings, and allowing others to lift us when we can’t shoulder the load of those feelings. The heaviness of giving a eulogy for a son who never had a chance to breathe. Having to talk to our just-old-enough-to-know daughter who was expecting two siblings. These are impossible moments; how can any parent go forward? Ever be whole? Consider that grief could mean meeting ourselves where we actually are. That’s what I’m talking about when I talk about navigating feelings. Recognizing we didn’t get to know Amadeo- but sure as anything we felt him. Felt his kicks, felt his presence. That feeling is life. I am not somebody who thinks everything happens for a reason. I’ve spent time here & here pledging that it’s ok to not be ok. For me the recognition that life can be out of our control is necessary; how we respond is what we do control, and it’s pivotal and determining. Example: In our instance, a twin stroller is on every block, an expectant family at every park. That can pierce your heart, but you can’t let it pierce you every day. Or a day like Mother’s Day or Father’s Day, it’s even trickier. The name Amadeo means God’s Love. May we all be open to seeing it in ourselves, may we be strong enough to receive it from others, compassionate enough to give it to others, and courageous enough to demand it from others.